More environmentally friendly locomotion means a sustainable urban transportation. The International Ecocity Standards identifies environmentally friendly transport as an essential urban design feature (www.ecocitystandards.org). Specifically, non-motorized transportation is supported and encouraged by the city and is used by a significant proportion of people for trips under 5 km. 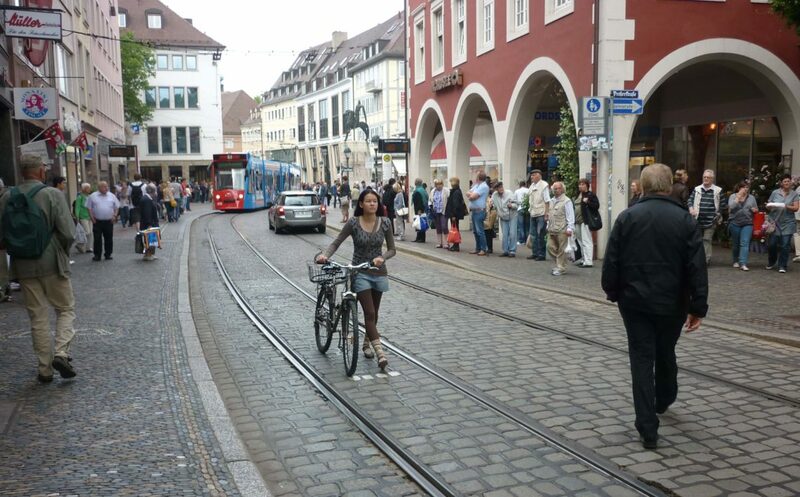 Mode split aims towards the access-by-proximity principle with 80% of all trips made by walking, bicycling or low emissions public transportation. Cities such as Bogota, Curitiba, and Copenhagen have advanced a healthy and equitable economy by placing emphasis on an affordable transportation system, one that promotes accessibility to everyone not just those who own a car (Curtis 2003; Goodman et al. 2005; Nelson 2007). These cities implemented integrated land use and transportation demand management strategies including: a) increases in density of both jobs and housing close to transit services, b) expansion of pedestrian, bicycle and transportation infrastructure and services, c) restrictions on motor vehicle use. Restrictions include a cap or even a reduction in roadway and parking available to cars, road tolls and parking fee increases, and limited access to the downtown based on license plate numbers and designated car-free days. Although most of these measures can work effectively, a challenge with limiting access to the downtown based on motor vehicle license plate is that it can be overcome by those with the means to purchase a second vehicle. This results in side effects that are socially regressive (biasing access to the rich) and environmentally counter-productive (increasing motor vehicle ownership). Cities with very high walking, cycling and transit mode share (i.e., 75% or more) typically have high density, mixed use urban centres at or above 100-200 people per hectare and are supported by a transportation strategy that prioritizes pedestrians first, then cyclists followed by transit users (Newman and Kenworthy 1999). Cities that achieve this level of mode split complement the Ecocity Standard of Access by Proximity and approach what would be needed to stay within ecological boundaries of greenhouse gas emissions associated with a one-planet lifestyle (Moore 2013, 2015). Systematic investment in bicycle infrastructure in Copenhagen has resulted in a significant increase in the mode split for cyclists, now at 41% of all commuter trips in the greater Copenhagen metropolitan area (Cathcart-Keays 2016). 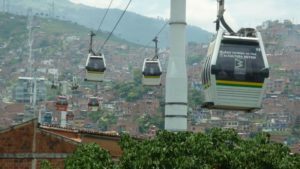 Reaching the unreachable: Gondolas have made it easier for people living in many of Medellin’s favelas to access different parts of the city with ease and convenience. Another good example can be found in Medellin, where investments in rapid transit comprising rail and gondola (funicular) have increased mobility for thousands of people living in the hillside favelas. With mobility comes access to education, jobs, and services in the city centre and across the region. These investments in environmentally friendly transport have helped to transform the socio-economic prospects of affected residents without substantially increasing traffic congestion, air pollution, or greenhouse gas emissions. Complementing transportation infrastructure with allowances for urban centre development at the major transportation nodes, can help to reduce transportation demand and encourage more local trips by walking and cycling. An important consideration going forward, will be to manage the development that transportation investment stimulates so that increases in density do not: a) dislocate existing populations as property values increase nor b) stimulate car-oriented development as well-serviced areas gentrify. Environmentally friendly transport designed for the human body instead of the car body is an important aspect of ecocity development that can yield substantial socio-economic and environmental benefits. Cathcart-Keays, Athlyn. 2016. “Two-wheel takeover: bikes outnumber cars for the first time in Copenhagen,” The Guardian, November 30, 2016. Available online: https://www.theguardian.com/cities/2016/nov/30/cycling-revolution-bikes-outnumber-cars-first-time-copenhagen-denmark (Accessed on June 16, 2017). 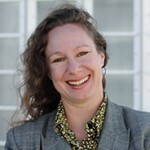 Moore, Jennie. 2013. Getting Serious About Sustainability: Exploring the Potential for One-Planet Living in Vancouver. A thesis completed in partial fulfilment of the credential of Doctor of Philosophy in Planning. School of Community and Regional Planning, University of British Columbia, Vancouver, Canada. Available online: http://elk.library.ubc.ca/bitstream/handle/2429/44943/ubc_2013_fall_moore_jennie.pdf?sequence=1 (accessed on 14 November 2014). Moore, Jennie. 2015. Ecological Footprints and Lifestyle Archetypes: Exploring Dimensions of Consumption and the Transformation Needed to Achieve Urban Sustainability. Sustainability, 7: 4747-4763. doi:10.3390/su7044747. Newman, Peter and Jeffery Kenworthy. 1999. Sustainability and Cities: Overcoming Automobile Dependence. Washington DC: Island Press.